I recently purchased a wonderful little gem on the 3DS called Pushmo. I’m not very good at explaining things so I just put up the video to the official trailer. I highly recommend this game if you have a 3DS and enjoy visual-spatial puzzles like me. 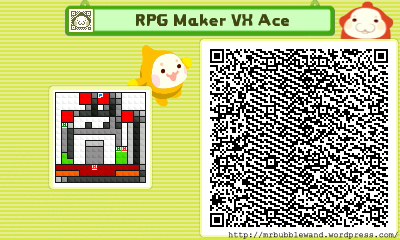 One of the awesome things about this game is that you can create your own puzzles and share them using QR codes. 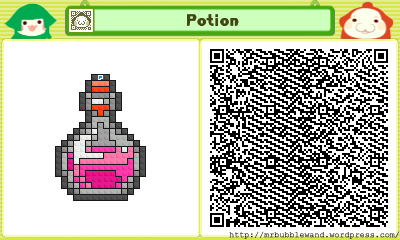 People can scan the QR code with their 3DS camera and they will receive and store the data for the puzzle. It’s the VX Ace editor icon! This one was easy to make since the icon is so simple. Of course, that means the puzzle itself is rather easy as well. The maximum length and width a Pushmo puzzle can be is 32×32 which means RTP-styled sprites can definitely be translated into Pushmo. However, the palette limit is 10 colors. Since pixel art is not my forté, translating an RTP sprite with so few colors is difficult for me. Believe me, I tried. This entry was posted in Gaming and tagged Gaming, pushmo, vxa. Bookmark the permalink. 1 Response to Gaming: Got Pushmo?